With just a day and a couple hours to the start of this years Southern 100 road races, held near Castletown in the Isle of Man, it is time for its own thread since it is one of the few internationals alongside the NorthWest 200, the Isle of Man TT, The Manx GP and the Macau GP. The Southern 100 races, also called the friendly races, run from Monday 9th to Thursday 12th. First off, a small introduction to the Billown circuit, located just outside Castletown, the Isle of Mans old capital. Roads Close 6.00pm till no later than 9.40pm. 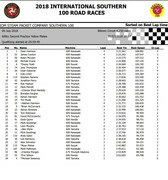 Station Garage Junior Solo Founders 125cc/400cc/Moto 3 Race 6 laps. Ace Hire & Sales Formula Two Sidecar Race, 6 laps. Roads Close 9.30am till no later than 12.15pm. 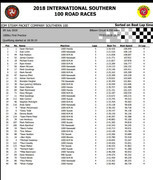 Island Aggregates Superbike Race, 7 laps. Roads Close 1.00pm till no later than 5.30pm. 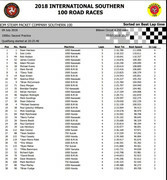 Hunts Motorcycles 600cc Challenge Race 7 laps. But be aware, that Mondays practices sometimes are not broadcasted live. Fast and safe racing everyone ! Manxradio AM1368 just announced a 7.20pm start of its coverage tonight, so one hour until it begins. An incident during the opening practice session of the 2018 Isle of Man Steam Packet Company Southern 100 International Road Races which resulted in the 600cc Second Session being red-flagged saw the rider being taken to Nobles Hospital by helicopter. After which the rider, Tom Robinson was airlifted to a Hospital in the UK for further treatment, where he remains in a critical condition. Best wishes for a full and speedy recovery to Tom Robinson, still listed as in critical condition. Sorry, cocked that up. Radio is live now ! Here we go, ready to race ! Thanks for the updates Andy. Unfortunately I am having sound problems with my computer atm so listening to Manx radio is not working for me. Edit: Doh I just realised I can use my tablet thingy to listen to Manx radio. Its hooked up to my wi-fi so should work no worries. @Andy any updates on Tom Robinson's injury status / prognosis? I looked but can find nothing later than the initial reports. I was a bit concerned over his prospects on reading he was airlifted from the local hospital to the mainland. Hopefully his condition is stable / improving. No news, I'm afraid mate. But that he's been airlifted out means that he's stable enough to be transported at least. Thanks. Good point re the fit to transport.